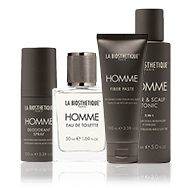 Precisely geared towards men's skin and hair needs. The Power of Plants for Hair & Skin! Add Definition & Bounce to Curls! Each skin care formulation created by La Biosthetique has been carefully researched and individually customised for all skin types, but all created with the same aim, to help your skin’s condition due to the effect of environmental influence, and every day stress can have. You can be rest-assured that due to fully unique care range from La Biosthetique, you will have the ultimate skin care experience from products designed to enhance your skins health, natural beauty and hydration, which will leave your skin feeling restored. 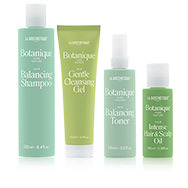 Enhancing the power of plants, La Biosthetique's Botanique collection contains a range of products to nuture and care for your hair and skin. Free from animal ingredients, parabens, mineral oil, silicones, sulphates and alcohol, the 100% vegan ranges are formulated with natural and sustainable ingredients. 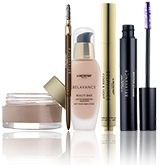 "Whenever possible we prefer natural active ingredients. We are convinced that effect principles that adjust themselves to the nature of hair and skin achieve the best results in the long term. Our goal was to use the power of plants to create our own range. We were inspired by millennia of phytotherapy (herbal medicine). We applied this basic idea to cosmetics in the form of Botanique Pure Nature. Our plant active ingredients are rated according to their effect and intensity." ICEA certified halal friendly, each of the three ranges within the Botanique collection cater to different hair and skin concerns. The Gentle collection is ideal for cleansing and calm, the Balancing collection is perfect for reactive skin and the Intense range is ideal for those with damaged and dry hair. As well as strong ethics, the Botanique brand also believes in product enjoyment and have worked closely with award-winning Berlin-based creator of botanical Perfumes, Tanja Bochnig, to finish the products with aromatherapy scents. 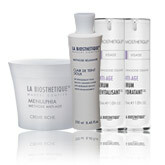 La Biosthetique Natural Haircare is an innovative collection of products for every hair type. All of the products within the La Biosthetique Natural Haircare range combine organic purity and naturalness with luxury and professional quality products. Every product in this range contains 98-100% of naturally originating ingredients of which up to one-third are sourced from organic cultivation. La Biosthetique Natural Haircare products are free from synthetic colourings, perfumes, silicones, synthetic care substances as well as being free from paraffin oils, parabens and synthetic resins - the result is a beautifully natural haircare range designed to improve your hair's quality in the best way possible: Naturally! La Biosthetique offers an extensive range of daily care and treatments to combat scalp conditions for a healthy, balanced result. Healthy hair starts with a healthy scalp! La Biosthetique Make-Up is at the forefront of quality make-up, designed for ease of use and luxurious results. Twice a year La Biosthetique releases a new range of make-up inspired by that season\'s trends and colours so that you stay one-step ahead of the rest with your make-up. 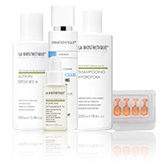 View all La Biosthetique products in one place. 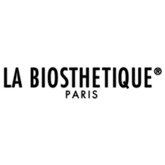 La Biosthetique is family-run company known around the globe, is based in the fashion capital of the world – Paris. They believe that beauty means a number of things, it can begin with an idea or a specific attitude. At La Biosthetique they combine state of the art research with natural ingredients, along with their passion for beauty, they believe that the highest quality is a prerequisite for the “Culture of Total Beauty” not just simply a possibility. Within the La Biosthetique Brand there are different categories, such as: Hair care – they believe that hair is a way to express your personality, feelings and style. To have healthy, stunning hair, starts with a healthy scalp, this is why the La Biosthetique scientists have been focusing on these connections. Skin Care – La Biosthetique see the skin as out link between our bodies and the outside world, the foundation and aim of every beauty care, is to have beautiful, healthy skin. This is why all their beauty products are geared towards this notion. Colour & Makeup – hair colours are changing along with makeup with every new fashion trend, every La Biosthetique product strives to fulfill the delight and passion of these trends. Yet, they always provide the best quality products. La Biosthetique Relaxante Gentle Cleansing Lotion – this unique product contains a medical white oil which forms a protective layer on your skin, whilst panthenol works to act as an anti-inflammatory to combat any pre-existing irritation. This product it perfect for even the most delicate skin thanks to its soft and mild consistency and calming effect. La Biosthetic Methode Regenerante Menulphia Jeunesse Riche – a deeply nourishing cream which helps to relieve dry and tired looking skin through stimulating skin cell renewal, smoothing the appearance of fine lines and wrinkles. With this product the skin appears smoother, firmer, and refreshed. Improve your microcirculation with this product to ensure a radiant and youthful-looking skin.